What is the maximum distance I can have between posts? I am looking for plans and or prints to build a 20 x 20 pergola in my back yard, most of the ones I see are for smaller design. I plan on using 6 x 6 for the posts and sunk in the ground 2ft in concrete. I'm trying to come up with a design to NOT have a post in the center for support if possible. Can you please help with the design? 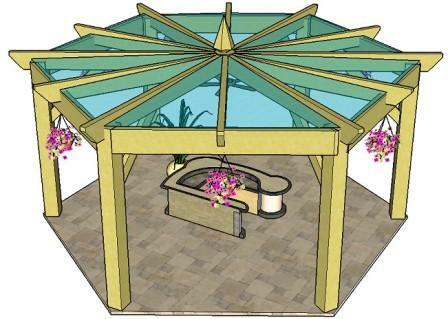 The free pergola plans can be made to any size you wish, and can be modified in several ways to achieve the look you want. However, for a timber pergola, this pergola beam span is too large. You are at severe risk of sagging. Think of book shelves. Over time, with the weight of books standing on top, they do sag in the middle. Even the weight of the shelves alone will cause them to droop in the middle. This is what will happen if there are insufficient supports for the rafters. 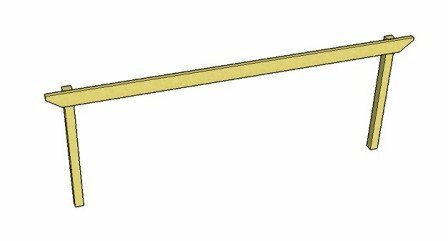 I would have main beams of up to 10' max; less if possible, certainly for anything up to 2" x 6" timber, ideally around 5'. The acceptable span does increase, however, the thicker and deeper the wood. The type of wood you use for your project makes a difference, too: some timbers are harder than others. Using a vinyl kit (they can sometimes be found with a 20' span). Putting in a post at 10'. Using corner braces to shorten the span. Adding posts towards the outside of the span. Let's take a look at the last option, and get creative. This option not only provides interest to the structure, but also keeps the centre space clear (which is the main concern usually). Here we have a very long pergola beam span of 20m. To shorten the span, install two additional posts to bring the centre distance to around a maximum of 10' (less if possible). So for this particular pergola we'd need to position posts at 5' in from the outside posts, giving the two 5' spaces and a 10' space in the middle. Increase the timber to 2" x 8" and you'd probably get away with having a 4' end space, leaving a 12' centre measurement. Do be aware however, that this wood will be extremely heavy! Even 2" x 6" will take a bit of shifting. Doing it this way can achieve a really interesting look. Another option is to add trellis panels. These panels can create a very intimate and cosy space, as well as providing support for climbing plants. I'm wanting to build a 22' X 12' pergola and was wondering with a 2"X12" on the 22' span will 1 board per side be enough or will I have to double up? Beam span is always a tricky one, Greg. Many people ask this question. There is no definitive guide for it, but it's always best to err on the side of caution. Check it out thoroughly if you decide to go ahead with a longer pergola beam span. Ask at your timber yard. They should have charts of width and depth measurements for different types of timber, to cover a particular span. Even though a double beam will obviously give more support to the rafters, 22' of beam needs support somewhere along it's length. It's not the weight from the rafters that's the only consideration, it's the beam under its own weight, as well, that makes it sag, if unsupported. Just using braces wouldn't reduce the span enough. A good way to get around this is to install two posts inside the end posts at say 4' to give a total reduction of 8' leaving a span of 14' in the middle. Maybe use decorative trellis in this 4' section to make a feature of it. (Example diagrams shown below.) 5' end sections would be even better. "You need to go to a local lumber yard that carries engineered wood beams (called micro-lams or LVL's). The lumber yards have pre-calculated charts that will help you determine the exact width and height of the beams. You will need to provide them with some detail as to what is being supported. Your best way would be to take pictures... to make sure enough info is at hand for the calculation. You also need to make sure you have adequate support under each end of the beam. Have this discussion with the lumber rep as well. ...DO NOT consider using any number of 2x12's (or smaller) for a 22' span. It will not hold without severe bowing. You're getting free advice from a professional. Please don't listen to amateurs when it comes to structural integrity." "22 feet for a span will not work (for 2" x 6" beams). You need at least three support posts and four would be even better." 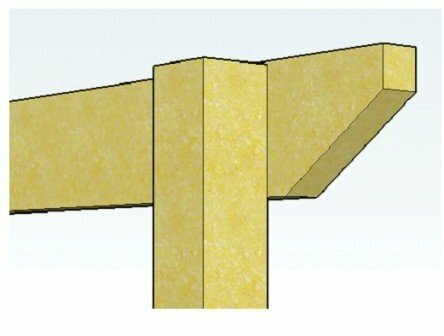 If you really want the longer, uninterrupted pergola beam span, do a bit of research into reinforced beams and vinyl pergolas to see if either would be viable. It depends on whether you really would like to build your pergola yourself, and how much experience you have. This type of constuction is more suited to contractors. 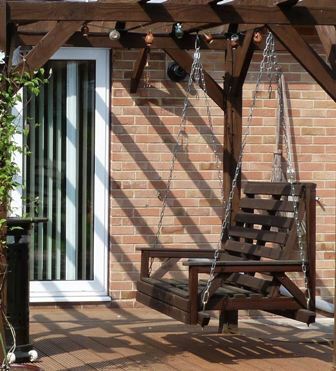 With thicker, deeper timber it's possible to have a longer beam span, but this may require specialist lifting equipment, too, and may be beyond the scope of those wishing to build a DIY pergola. The smaller pergolas, given as examples in the free plans, are made by bolting the main rafters/beams onto the posts. Two beams can be used for extra support, one on each side of the post. 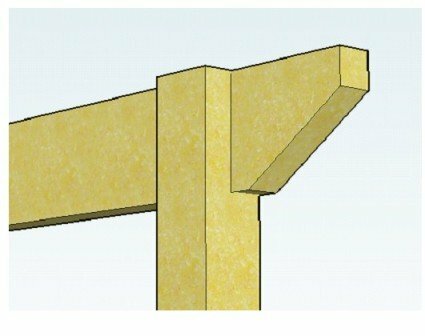 For a substantially larger pergola, notch the top of the pergola posts, and sit the supporting beam on the notch for extra support. Another way of adding extra strength and reducing the pergola beam span is by adding corner braces. This is easier to do when the post is notched onto the post, and looks neater. If the rafter sits fully on top of the post, it works well, too. Let's have a look at an example of how this can be a very effective way of making the unsupported length of your pergola shorter. Do you think this will prevent any sagging? An 18' pergola beam span is long. If you're erring on the side of caution - or even if you're not - it's too long. This hexagonal pergola is large, so needs to be very secure. Quincy decided on flat rafters. We looked at flat and pitched rafter styles, the pitched rafters being substantially stronger, due to the fact that they form a very strong triangular shape, with upthrust, supported by a king pin. The other option was to have a post in the centre. 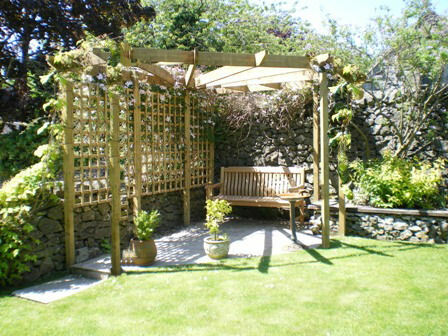 This is often used in this style of pergola as an attractive feature. He'd like his pergola beam span to be 18 ft, excluding rafter tail ends, so the beam span needed to be shortened considerably. The pergola is going to be 10' high, as he is a tall chap, so, at the six posts, a sizeable corner brace can be installed without the risk of banged heads. Let's take a look at how to cut down the span using these braces. These also make an attractive feature. If we take the 8" post and add a space of 2.5 ft and then approximately 11" for the diagonally cut 8" deep brace, it gives a measurement of 4ft 1" or 1.25m. Multiply this by 2 to give the distance in from this end and from the other end of the rafter at the opposite post, giving 8ft 2" or 2.50m. 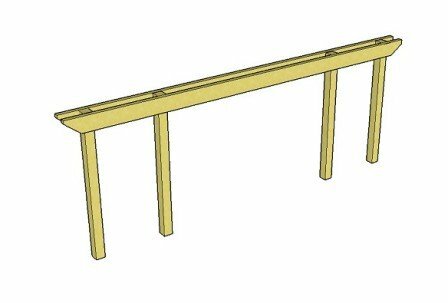 Subtract this from 18 ft or 5.5m, giving 9ft 8" or 3m as the unsupported pergola beam span, which is much more acceptable for 3" x 10" wood. (10 ft post = 120") minus (2.5 ft for the space = 30" + 11" for the brace = 41"), which gives 79", 6 ft 7" or 2m, enough even for a very tall person. There seems to be no definitive beam spans for pergolas, unfortunately. Generally speaking, though, it is recommended that for a 12' span you will need at least 2" x 8" treated or hardwood timber or more. Go much above that, unsupported, and you're looking at a reinforced beam. Geoff, a builder friend, once said that for a smaller sized pergola, with 4" x 2" rafters, the pergola beam span should be no bigger than the width of a standard fence panel, or 6ft. Good advice! Try to keep as near to that as possible. 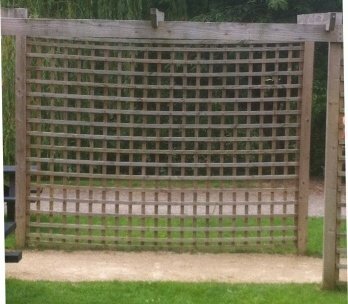 It's not quite the same thing, I know, but the principle is the same...take a look at this trellis panel. 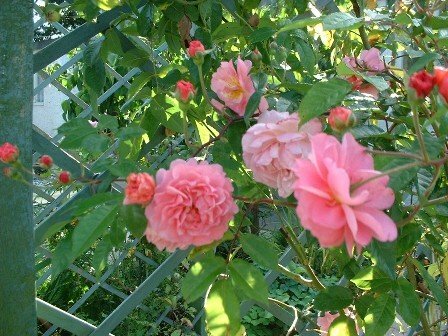 It was part of a series of panels and corner features, making walkways and flower borders, which was, indeed, very attractive. Visually, though, there was something wrong, and then it clicked. Look at the sag on the laths forming the trellis. The span was just too big with 7 ft panels. It hadn't been built for very long, either. 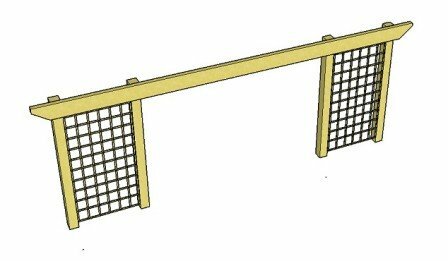 I want to build a pergola with a single span - between 6"x6" posts - of nearly 16'. Obviously, I don't want it to sag. 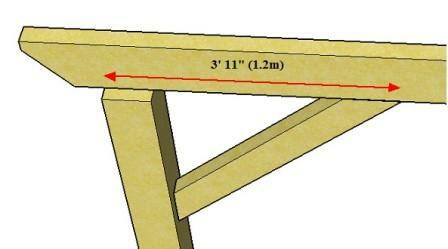 Would I be better off with 2 rafters per post/length and would 6" x 2" be big enough? Again, this is long for a span between posts. 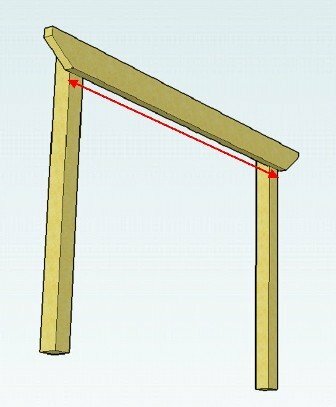 Wood will sag under the weight of other objects (rafters), but will also sag under its own weight if the supports are too far apart. A double main rafter, or beam, can be used to give more support, and corner braces could also reduce the span, but do try to reduce the distance between posts if at all possible. The depth of the rafters for a 6" post could be anywhere between 6" and 12", depending on the look you want. If unsure, make a mock-up with some offcuts, just to get an idea. With this lovely corner pergola, I made the front diagonal rafter shorter by adding the two side posts, making the diagonal about the same measurement as the sides, at 8', using 1.5" x 6" timber. Often it is a balancing act between the appearance of the pergola, and the effects of gravity, coupled with the load-bearing capacity. Use inventive ways to reduce that span. For smaller pergolas it's not such a problem. For those wishing to build something on a grander scale, with a longer pergola beam span, weigh your options carefully, and always be cautious! Always check with your wood yard or timber supplier to give more definite timber size suggestions.